Veteran NFL reporter Pam Oliver will be celebrating her 20th season as a FOX sideline reporter this fall, but the role has changed a bit — and no one is happy about it. According to Sports Illustrated, FOX is replacing Pam Oliver with Erin Andrews, who will take over the position on the No. 1 sideline spot with sports journalism stalwarts Joe Buck and Troy Aikman during the upcoming football season. Oliver has been demoted to the No. 2 team, and by 2015 she'll be gone from the sidelines altogether. Oliver confirmed the news to Sports Illustrated Sunday night, saying it was a shock when she first found out about FOX's plans in April. To go from the lead crew to no crew was a little shocking. I said I wanted to do a 20th year [on the sidelines]. I expressed to them that I was not done and had something to offer. Again, I think it was predetermined coming in. Not at that meeting, but two years ago it was determined that no matter what I did or did not do, a change would be made for this year. According to SI, FOX Sports executives met with Oliver in Atlanta to break the news of her replacement. Oliver then met with her agent and held meetings with other sports outlets. But before Oliver and her agent could make a deal with another outlet, FOX Sports agreed to give her one more year as an NFL sideline reporter — but she'll still have to play second fiddle to Erin Andrews. But she insists she's not done. Following her tenure as sideline reporter, Oliver will continue to do long-form pieces, including sports specials and interviews. I think in the last five years we have made a lot of changes with the NFL crews. We have made changes to keep our coverage across the board fresh, including the addition of Burkhardt and Lynch -– which has been one of the more exciting pairings we have put together. This is kind of the next move in that evolution. But some believe there might be more at play here, including possible ageism. Oliver is 53, while Andrews, who currently hosts FOX College Sports, is 36. Looking at current and former FOX sportscasters, it's not hard to see that Oliver skewed older — sometimes, by decades. Former FOX sideline reporter Kristen Ledlow, for instance, was barely 25 when she first joined the network (Ledlow now works for NBA TV). Elizabeth Moreau, who currently reports on college football for FOX Sports South, is 31. Popular FOX Sports 1 anchor Charissa Thompson is also in her early 30s. It seems that once a female sideline reporter starts to near 40, such as longtime ESPN reporter Wendi Nix, she's no longer fit for the job. Just ask Complex magazine, who described Nix as "a bit older for a sideline gal, but she's still a lovely woman" in their "Hottest 25 Sideline Reporters Right Now" slideshow. Oh, and lets not forget that although Oliver is older than Buck and Aikman, she fits more in line with their demographic: Buck is 45, while Aikman is 47. Of course, there's also the elephant in the room nobody wants to address: Erin Andrews is white and blonde, right up FOX's alley, or so the meme goes. The network's long-held tradition of employing (mostly) blondes was investigated on FOX News itself recently, and the network was relieved to find out that while it has 14 blonde anchors, there are 12 non-blondes to counterbalance them. 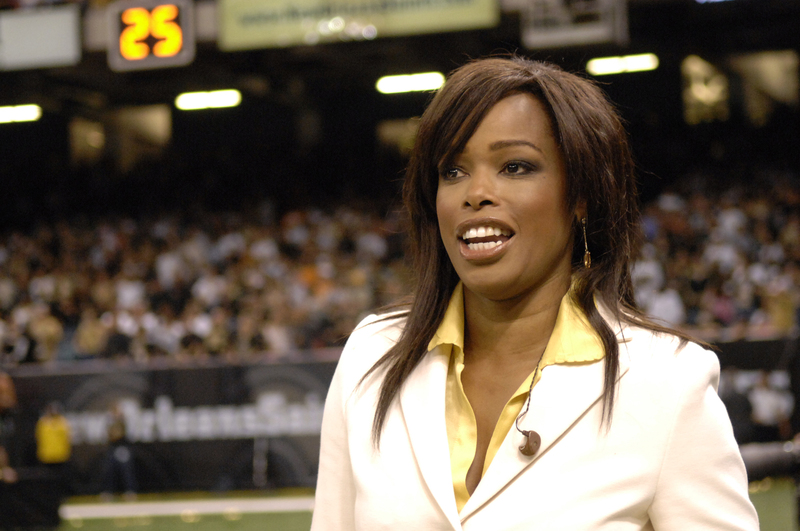 For now, we can only speculate what Pam Oliver's demotion to No. 2 — and eventual departure from sideline reporting — means for middle-age women and women of color broadcast journalists in America. And from what we know so far, it sure doesn't look that good.